We would like to introduce you to our Handy Art® products and our company. 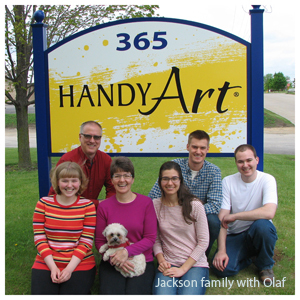 Handy Art® has been family owned and operated since 1974. Everything we offer is manufactured right here in Milton, Wisconsin. We use the finest materials in manufacturing non-toxic, water based paints, inks and glues and pride ourselves in supplying high quality reasonably priced products that are made in the USA. We produce a full line of products: tempera, acrylic and washable paints, face paint, washable finger paint, washable liquid watercolors, gesso, block printing and India inks, fabric paint as well as washable glitter glue, washable glue, white and black glue. Our family of Handy Art® lines includes Little Masters®, Nu Master® and Designer's Pallette®. We hope you are as excited about art as we are! If you have any questions, or if there is anything we can do for you, please give us a call or email us at handyart@handyart.com.